When breaking down a character, you can distribute each selected art stroke to a new layer. Each stroke you select in the Camera view is automatically placed on a new layer. One layer per stroke. If one part of your puppet is composed of several strokes, you must group them before distributing them onto new layers. NOTE: You cannot distribute layers in the Drawing view; it must be done in the Camera view. In the Camera view, select the art strokes you want to distribute to different layers. From the top menu, select Drawing > Distribute to Layers or click the Distribute to Layers button in the Tool Properties view. Drawing layers are created in the Timeline view, each corresponding to the different strokes or groups of strokes selected. Each stroke or group of strokes is distributed into each new Drawing layer. 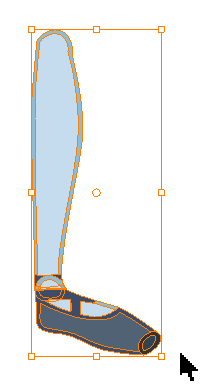 The selected strokes in the original drawing layer are removed.